I’ve been back in the US for 6 weeks now and apart from our weekly pizza night, I’ve yet to use my sourdough starter that I brought back from Umbria with me and then tenderly fed to bring it back to life. In Umbria, I bake healthy grain filled breads weekly that we use to toast, make sandwiches, or simply nibble on as a snack, as that type of bread is not readily found there. Here in the US healthy grain bread is readily available so I find I just do not bake bread as often, even though it is something I truly enjoy. 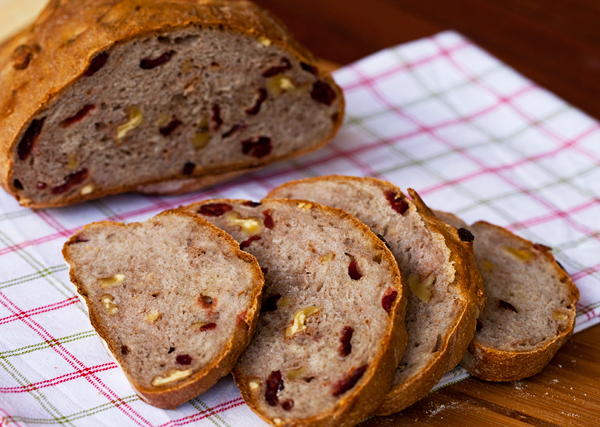 With the holidays approaching, I know I will have house full of hungry folks that all love breakfast, so I decided to break out my starter and bake this holiday inspired, cranberry studded bread made just a little healthier with the inclusion of whole wheat flour and walnuts. If you do not have your own sourdough starter in the refrigerator, I will include a biga recipe which is an overnight starter that adds flavor to the bread. This bread freezes really well, and is wonderful toasted. 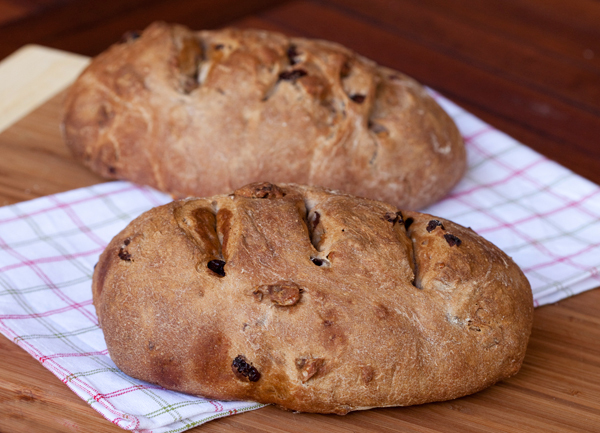 The bread is studded with walnuts and cranberries which add both a nice texture and sweetness to the bread. Please note that the amounts of flour and water are approximate. If your dough is dry, add a little additional water. If you added a little too much water and your dough is a little too sticky, simply add a little extra flour. Bread is very forgiving unlike other baking projects so you can easily adjust as needed. The addition of whole wheat flour help to make this bread heart healthy. Nuts are a good source of protein and are rich in phytosterols which help to lower cholesterol. Also rich in fiber and vitamin E.
Cranberries, both fresh and dried, are a good source of dietary fiber, proteins, and carbohydrates. A healthy, holiday bread that is great toasted. For the biga, Mix the yeast and water together, and then slowly start adding the flour, mixing well. Cover with plastic wrap and let sit at room temperature for up to 6 hours and refrigerate overnight. The next day, take 1 cup of the biga (refrigerate rest for another project) and mix together with the flours, salt, cinnamon, orange zest, sugar, and yeast in a large bowl. Begin to add water, stirring as you go and add as much water as is needed to bring everything together into a fairly firm dough. Stir in the walnuts and cranberries, then dump the mixture out onto a lightly floured surface and knead by hand for 5 minutes until smooth. Lightly oil a large bowl and then place the dough in the bowl and cover with plastic wrap. Let the dough rise in a warm place in your kitchen until doubled in size, about 1 1/2 to 2 hours. Punch down the dough and divide it into two equal pieces. 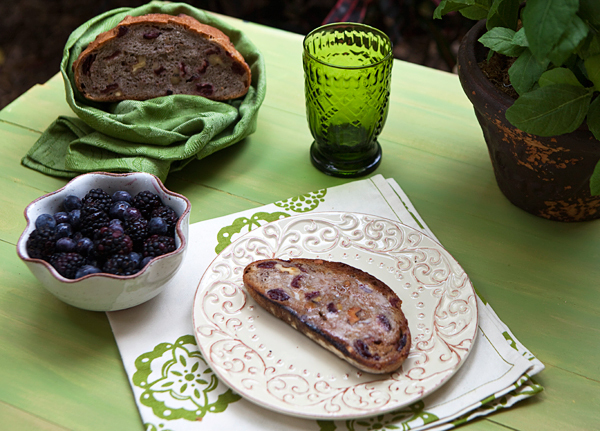 Share each ball of dough into an oval loaf and place each on a cornmeal dusted baking sheet. Cover the loaves with a kitchen towel and let rest 30 minutes. Cut three slashes into each loaf with a sharp knife and then bake until the internal temperature of the bread reaches 190 degrees F., about 35 minutes. Cool to room temperature before slicing.